. كما يقدم إن كرينز بوتيك أبارتمنتس الكثير من الخدمات لإغناء رحلتك في المدينة. يمكن للنزلاء الاستمتاع بالميزات التالية: واي فاي مجاني في جميع الغرف, خدمة سيارات الأجرة, أمن على مدار 24 ساعة, مطبخ, تسجيل وصول/خروج سريع أثناء إقامتهم في هذا المكان الرائع. يمكن للنزلاء الاختيار من ضمن مجموعة من الغرف المصممة بعناية لتعكس جواً من الراحة، والتي يتجاوز عددها 38. كما أن مجموعة الخدمات الواسعة الموجودة في الفندق لضمان راحتك تترك لك الكثير من الخيارات لقضاء وقتك أثناء فترة إقامتك. اكتشف مزيجاً ساحراً من الخدمة الاحترافية والخيارات الواسعة من وسائل الراحة والمتعة في إن كرينز بوتيك أبارتمنتس. Nice accommodation located in the center of town. The only disappointment I have with Inn Cairns is the units with the single bedrooms do not have any curtains to block out the light shining into the room at night from the front entrance or the bright sunlight in the morning. So, having a good night sleep in a dark bedroom is not an option. Inn Cairns need to invest in block-out curtains that covers the glass bricks that also acts as a source of natural light for the bedroom. Location is great; along a quiet street surrounded by shops, cafes, restaurants & a supermarket just opposite it. A comfortable 10 min walk to Cairns Shopping Mall, the Night Markets, etc. Area is safe. Room is self-sufficient for my needs; washer dryer, fridge, microwave & cooker. Wifi is non-existent in the bedroom but strong in the living area. Space in the bedroom feels clean but I'd prefer the carpet in the living area is changed/removed. Staff is friendly and helpful! Will definitely stay here again. It's not expensive, so if you have a low budget, it's a pretty good option. You just to have to bear in mind that it's like renting an apartment instead of serviced apartment, so you need to pay for tooth kit and extra shower amenities if needed. The inn itself is pretty old but with complete facilities and appliances for every unit. Spacious and really well equipped unit including full kitchen and free washing machine and drier in the unit. Location was very central to the heart of Cairns and the bedroom was away from road so no street noise. The full kitchen and supermarket directly opposite was great for self-catering. Helpful and friendly staff. Good value for central Cairns. Highly recommended. 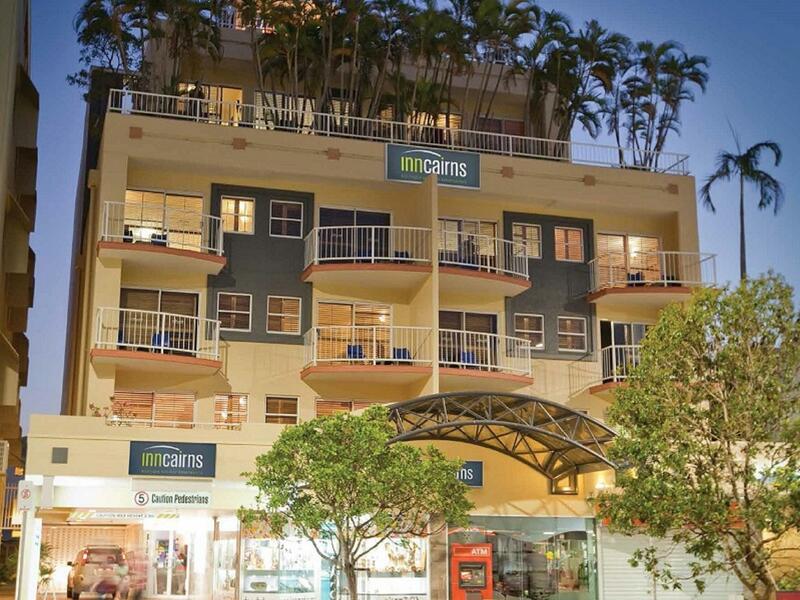 What a great place ideally located in the heart of Cairns , everything was within walking distance . Great friendly and helpful staff only to happy to help , I would highly recommend this place to anyone looking for a great place to stay . I know that I will be back. Hi James, Thanks for your kind words, it's great to hear that our efforts are noticed and appreciated, Hope we see you again soon. it located near the CBD of Cairns. nice room and area. also very kind staff. Location of these apartments is great but they badly need some TLC. Old facilities. We had issues with cooker and aircon. Whole place needs a refurb. Staff not very friendly.. not rude just not friendly. Wouldn't stay again or recommend. All of things are Excellent. Especailly Location & Facilities. The airport & restaurant & reef terminal are only a 10-minute walk and the woolworths is right ahead, so really convenient. And we was able to wash our clothes with washing machine. It is really good. Hello Sangah, Thank you for your kind remarks. We are very happy that you enjoyed your stay, and we hope that you can return soon. Such Lovely helpful staff, always chatty and friendly. made us feel so welcome and nothing was too much trouble. Hard to find such amazing friendly service these days. And on that alone we will be returning when we visit cairns next. The Room was perfect for my son and I, everything we needed. And Close to it all. Thank you so much that we had great stay at Inn Cairns apartment. We stayed 3 night with my family including 7 years old son from Japan. Good location, kind staff, and warm hospitality. Pool was also good! We spent days in Cairns looks like "living in our home". Thank you again, we hope to visit and stay again your apartment someday. Hello again Keiko, Thank you for your kind review of your stay with us. We are very happy that you enjoyed your stay. You were very clever to book your stay so early, Accommodation for New Year's Eve is very hard to find. Thank you again, we are looking forward to seeing you soon. Good comfortable apartment, a bit dated but very comfortable. Conveniently right in city and close to most attractions. Pool not heated and water on the cool side. If we went to Cairns sometime in the future, we would definitely book there again, as it is great value for money. The units are individually owned and ours could have used some improvements, e.g, the carpet, the deck furniture, the tiles in the shower/tub. But it was well equipped and had everything we needed. I even did a load of laundry. The rooftop patios are a huge asset! The grill down by the pool was well equipped. We loved our stay at Inn Cairns. We were within walking distance from everything. The shops, restaurants, esplanade, Casio & lagoon were all less than a 10 min stroll from the apartment and Woolworths was literally across the road, incredibly convenient! The apartment was clean, quiet and affordable and the staff friendly and accomodating. We would definitely stay again in the future. Good location and nice apartment and facilities.Plenty of free secure parking a bonus. The big negative is the noise from Lake Street because of the clubs and bars and even the council street sweeper which goes from late at night until the early hours of the morning (not possible to enjoy a relaxing holiday sleep in at all)!!!!!! We stayed there for 5 nights. We found the place very comfortable, and it is located in the action - close to restaurants, lagoon, harbour, supermarket located over the road... It made for a very easy short holiday.. The apartment was spacious and well laid out. Bed was comfortable, room was clean. The kitchen is very sparsely outfitted so we didn't cook in the unit as we had planned. It was handy to have a fridge for juice, fruit, beer etc Check out Rusty's market for wonderful fresh fruit. Woolworth's and Beer, Spirits, Wine are both across the street. Woolies has a cooked food counter and coffee service, which was handy.